How did this all start? Well, yesterday, a car pulled into our parking lot and it was a G6 sports two door. And I thought, hmm, I could go for one of those cars. 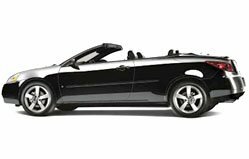 And then when I got on the GM website, I found that the G6 also comes in a convertible. Which I've always wanted, but never went for. So I did a bit more researching, and discovered that my insurance on it would be exactly what I was paying for the car I have now, it's just the payment would be 100 to 200 more a month. Which isn't really out of my range, just that it's an extravagance I normally shy away from. However, now that I'm going to be somewhat debt free in the fall, I'm seriously considering a new car should GM offer some sort of incentive (or other deal to get their expensive cars off the lot) that would come up when I hit my two year lease mark this December. I'm going to watch it, and see what happens. After all, they want to sell their cars right??? Eeee, I'm so in love with this car! that car is hot! What color are you thinking?